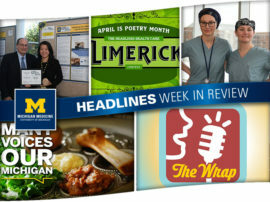 March Madness is here, so “tip-off” your weekend in style with the Headlines Week in Review! Over the past few days, readers learned about MedSport, a Michigan Medicine clinic that gets athletes back in action as quickly as possible. 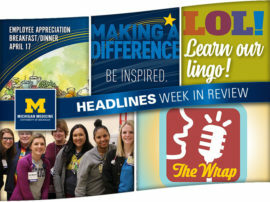 On top of that, two families shared their appreciation for superstar employees; faculty and staff were prepped for the upcoming engagement survey, which will help Michigan Medicine up its game and improve the employee experience; and it was Match Madness for students as the medical school took a look back at Match Day 2019. So be a good sport and check out anything you may have missed! 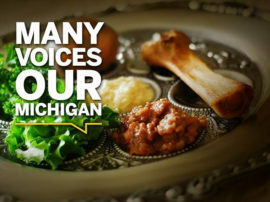 While athletes have taken center stage this week during the NCAA tournaments, there is a dedicated group of Michigan Medicine experts who focus on athletes and the sports they love all year round. Click here — or listen to this week’s episode of The Wrap above — to learn more about MedSport, which helps elite athletes or weekend warriors get back in the game! Every year, more than 40 percent of the 17,000+ Making a Difference award nominations received by Human Resources come from patients and their families. That’s because the work employees carry out each day directly impacts their lives and well-being. 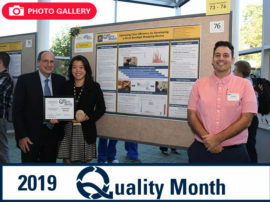 During National Recognition Month, check out two such families who felt the need to reach out and thank their caregivers from Michigan Medicine. 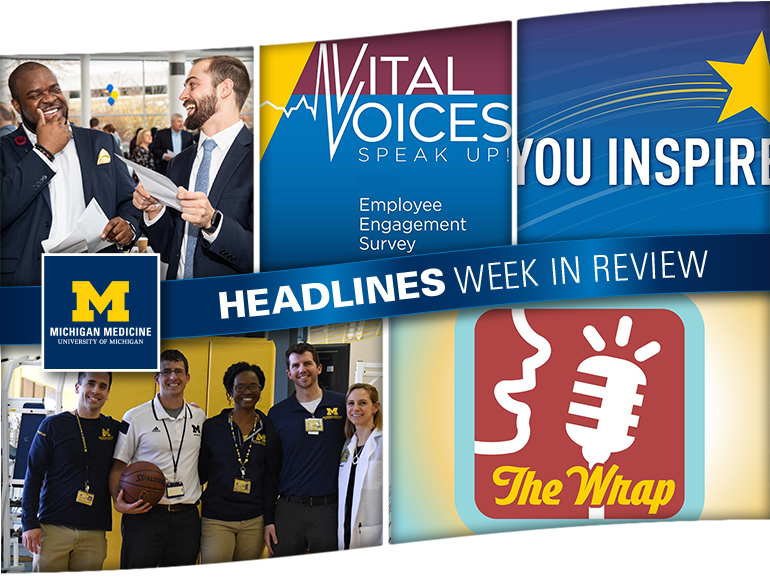 From April 1 until April 12, employees will have the opportunity to make their voices heard in vital ways to improve the work experience at Michigan Medicine. Click through for details of the 2019 Employee Engagement Survey, which will provide leadership with valuable information and accountability tools to keep the organization strong. Last Friday, hundreds of U-M medical students tore open envelopes and instantly found out where they’ll spend the next three to seven years of their lives carrying out residency training. It was all part of Match Day festivities at the North Campus Research Complex. Read more and check out a video and photo gallery from this year’s event.